LOGAN, Ohio — Logan overcame a Meigs comeback with two fourth period scores Friday night to defeat the Marauders 26-22 in a non-conference football contest at Logan Chieftain Field in Hocking County. The Marauders overcame a 13-0 Logan advantage at the half to briefly take the lead in the third period, setting the scene for an exciting fourth period. Mistakes hurt the Marauders as a fumble resulted in an insurance touchdown for Logan late in the contest. Even though Meigs was only called for three penalties, two of those miscues wiped touchdowns off the boards for the Maroon and Gold. The Chieftains took the lead early in the second period when Trevor Horner scored from five yards out. Israel Bookman added the pat for a 7-0 Logan lead at the 10:08 mark of the first half. On the ensuing kickoff, Cole Adams took it the distance for the score, but a penalty on the Marauders wiped it off the scoreboard. The Chieftains took a 13-0 halftime advantage into the locker room when Preston Yates scored on a six-yard run with 4:08 left in the second quarter. Midway through the third period, Cory Cox hooked up with Adams for a 62-yard scoring toss, but once again penalty flags on the Marauders negated the score. But just three plays later, Cox hit Weston Baer down the near sideline for 66 yards and a score. Lane Cullums added the two-point conversion at the 1:13 mark of the third period. Meigs booted an onside kick, and Adams recovered for Meigs at the Marauder 47. On second down, Cox hit Zach Bartrum over the middle cutting to the near sideline. Bartrum out ran the coverage for a 51-yard scoring play. The pass for the extra point was just short but the Marauders were suddenly on top 14-13 headed into the final period. The Chieftains retook the lead with 6:53 left in the contest when Yates scored from 15 yards out with 6:53 left to take a 19-14 advantage. Both teams’ defenses forced punts on their ensuing drives, but Logan came up with a big play that proved to be the winning score. A Tyler Cummin punt rolled dead at the Marauder three-yard line. On first down, the Marauders fumbled and Conner Ruff recovered for Logan in the end zone for a score. On the ensuing kickoff, however, Adams took the ball on the 20 and cut across field to the outside to take it the distance for the score. Cullums added the extra points to cut the lead to 26-22 with 2:15 left in the contest. Kyle Arnett of Logan fielded the ensuing onside kick and the Chieftains escaped with the win. 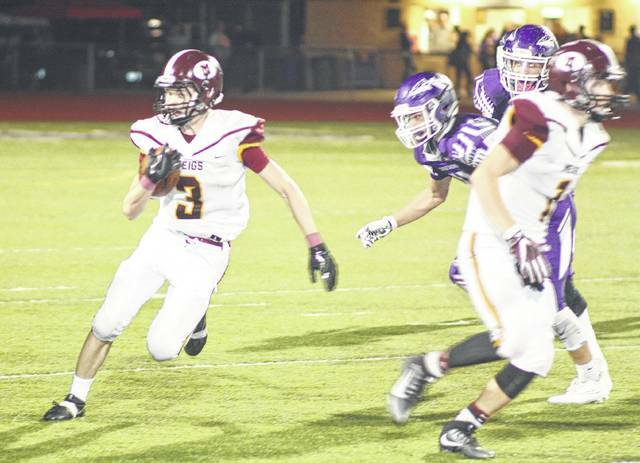 Preston Yates was a workhorse on the ground for Logan carrying 30 times for 257 yards. Brady Walsh added 27 in six carries. Walsh was 10-of-20 in the air for 94 yards. With Landon Little with eight receptions for 74 yards. Adams led Meigs on the ground with 39 yards in 11 tries, Lane Cullums added 22 in nine. Cox was 13-of-22 in the air for 202 yards and a pair of interceptions. Bartrum had four catches for 77 yards, Adams four for 40 and Baer two for 71. Logan (1-2) will host Sheridan next Friday, while the Marauders (1-2) open TVC Ohio play at River Valley. Meigs junior Cole Adams (3) runs for yardage after a catch during Friday night’s Week 3 non-conference football contest against Logan at Chieftain Stadium in Logan, Ohio.